The question stayed with me and I think I’ve come up with three possible reasons and solutions. Reason #1: You don’t have enough money. If you don’t have the money, you can’t pay the bills on time. If you earn enough money but aren’t disciplined enough to keep it around long enough to pay the bills, this is easy to solve. Creating a budget or spending plan will help you organize your money and know how much you have available after taking regular expenses into account. If you don’t earn enough money, then a budget will certainly help you use what you do have but it may be time to get another job, cut down on spending (if that’s possible), or find alternative income outside your regular work. How that will play out for you depends on individual factors. 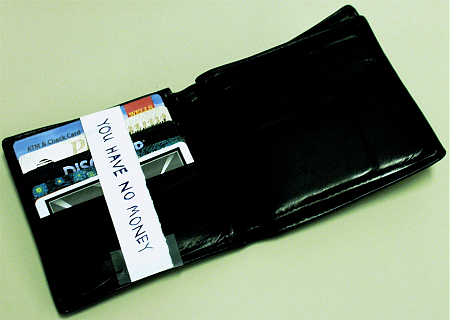 Reason #2: You’re afraid to pay the bills. We’re talking neurotic here. And I’m not blaming you, I can get neurotic about this myself. I don’t want to pay the bill until I have to, just so the money won’t go earlier. How did I fix this? Two part answer. First, I started focusing on our actual bank balances. Sure, if we both lose our jobs and make no money for a number of months then things could get rough. But we have more than a month’s worth of living expenses. So I would just stare at those balances and remind myself that paying the cable bill will not hurt our financial security. I might also throw in a dash of neurosis about what would happen if we didn’t pay the cable bill and I couldn’t work online. Or the water bill and I couldn’t shower…etc. Sometimes playing neurosis off neurosis can work, if you keep control over the one you’ve introduced, like a controlled burn. Reason #3: You’re just not organized. Maybe you have the money and aren’t worried about paying your bill. You’re just lazy/frazzled/busy/etc and decide to put it off. Then you forget. Then you panic. Maybe you pay a late fee or maybe you squeeze by. But it’s not a pleasant experience overall. There are several ways to organize yourself without a lot of pain. When the reminder shows up, pay the bill. That’s what I do with our cell phone bill. We’ve opted out of paper statements. But I didn’t want to leave paying at the mercy of my fabulous memory, so I set up a reminder. If it fluctuates but is always between the 18th and 20th, for instance, you could just set up a monthly pay-date reminder which takes the earliest possible date into account. Or maybe your rent is due by the last day of the month…setting a reminder up for the 28th should have you covered year-round. On the other hand, if the bill’s due date varies, you can set up reminders as you receive the bills themselves. Taking my credit card as an example, I received an e-mail the day the bill posted and the paper copy around a week later. Since it’s on a 25-day billing cycle, the due date will never be the same from month to month, so I can’t use a static reminder. While I simply pay it off on the first day it’s due, you could also use the arrivals of either the e-mail or paper statements to learn the date due and create a reminder. This month, that date was July 28th, so I could have set up a reminder to pay online by the 24th (or by check by the 18th…give it plenty of time to avoid postal screwups). Will these reminder systems work? They’re not magic (I wish! ), so you actually have to follow-through and act when you get the reminder. But I find that it’s not as hard or threatening when something I use for all my scheduling also points out a bill. I just pay it. Photo courtesy of Jeff Keen. When possible, I pay my bills online. The only one I can’t pay is my rent check, but I just hand that to my roommate/landlord. I automate everything 100%. All of my 10 or so credit cards have automatic debit payments set up. All balances are paid in full and automatically withdrawn from my checking as soon as the bills come in. I rarely pay attention beyond keeping tabs on billing accuracy…mostly to make sure returned products were accurately refunded and restaurants didn’t improperly tack on extra tip. I also receive only e-billing as requested – thus I never receive paper bills.. IF I forget, it’s because of #3. I usually do though…. I usually just forgot in the past, but I found that setting up the e-mail reminders on my gmail helped me pay on time. I suppose automation is another answer to this. But I’m still too neurotic to trust that. I’m worried that either it will pay too much or for something I don’t want or it won’t pay on time. I suppose I could automate bills and then set up reminders to myself to check on them. I guess it’s just that if I’m going to be checking on them anyway I might as well pay them too. Is it bad that i actually ENJOY paying my bills? haha… There’s something about those little guys that give me joy and accomplishment. We have a chart on our fridge that has the name of each bill, the (approximate) date it’s due, and a box where we can check off when it’s paid. Then, if either one of us wants to know if the phone bill has been paid, we can just glance at the chart. We have a couple bills that are automated, but most aren’t (we automated student loan payments because we got an interest-rate discount for doing so). It used to be #1 a lot. I did a poor job budgeting. Yes, it’s a witty and wonderful photo! Wish i was that creative. Only one thing would keep me from paying my bills: having racked up more bills than I had cash. To avoid that, I use Excel to keep track of the amount I have in any given billing period less the amount of each charge, so that a glance at the bottom line tells me how much is left to spend. So far, it’s worked…more or less… That and an emergency fund have have (so far) allowed me to pay all my bills on time. now if I could stop SPENDING SO MUCH…on food 🙂 but still. I only have one credit card account, and nothing else. For the credit card I have a debit order to pay the entire outstanding amount at the end of each month. For all my regular bills (insurance, etc.) I also have debit orders. So everything is pretty much simplified and automated. There is only one bill that I have to do manually, and I take care of this online at the end of each month. In my case, it’s mostly because I forget… I always pay my credit card on time because I don’t want to be the penalty. But for some reason, bills late fees don’t scare me as much. Note that I’m not that late. A couple of days at most. Bills are all due at different days of the months too, I because I get paid twice a month, I can not just pay all bills A, B and C on the 15th, let’s say. It’s just confusing sometimes. I think my problems are not having the money and forgetting. Great advice. Thank you.